Interviewed in 2006 by Ron VanGelderen, past President of the Cadillac-LaSalle Club. Published by permission. Copyright 2006 Ron VanGelderen. There are three other posts about Chuck Jordan on Dean’s Garage with many images. Charles M. (Chuck) Jordan was a celebrated automobile designer. He followed in the footsteps of industry greats, Harley Earl and Bill Mitchell, as only the fourth to hold the position of Vice President of Design for General Motors. Each was a pioneer in his own era because of unique character traits and abilities. Similarly, Chuck Jordan had some of his own, as if he were born with them. He was tough and very demanding. He possessed a demeanor that made him stand out in a crowd. Not only was he a natty dresser, but he stood poised and confident. He was a class act. Of special interest to Cadillac enthusiasts was his stint as Chief Designer of Cadillac. Under his watchful eye, some of the finest, most sophisticated, and clearly defined automotive designs were generated for the 1960 through 1964 Cadillac model years. Chuck made things happen. Later, under his executive leadership, some other design greats were initiated; for example, the 1967 Eldorado, the Oldsmobile Aurora, and the 1992 Seville. By the time Chuck Jordan had been appointed to the top position, automobile design had evolved into a well-defined process at the large assembly line production companies like General Motors. The one-man-show and flamboyancy were replaced by government regulation, safety requirements, and stockholder responsibility. Sophistication, justification, and presentation were “in.” Creativity had been stifled. Fortunately, Chuck Jordan had perfected the attributes he was born with that were necessary to overcome those creativity impairments. He was a master at justifying his proposals to management, with a calm deliberate delivery interspersed with bridled passion. Chuck has always been a designer with great passion. He vowed to bring back the elegance and the beauty of the cars to that era. He put a premium on creativity. His passion is contagious and inspiring. Charles M. Jordan always said, “If you love automobile design like I do, it is the greatest job on earth…it is challenging, exciting, satisfying, and rewarding. 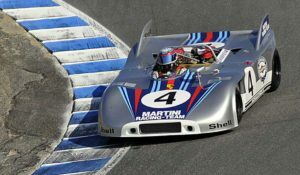 It never seemed like work.” It is this passion for automotive design that prompted the interview of Chuck Jordan who has had a very successful career that was fun. V: Chuck, when did you really become passionate about automobiles? J: Like some, you are born with it. As far back as I can remember, I was nuts about cars. I could identify cars at a very early age. Of course, it was easier in those days than it is today, but I was just nuts about cars, that’s all I could focus on. I was born in Whittier, California. My grandmother had a big influence on me. She would take me to Nixon’s church in Whittier on Sunday and bring pencil and paper to keep me quiet. I’d sit and draw cars during the service. I still have some of those old drawings. It was the first time I’d put things down on paper that expressed my passion of cars. V: As a sidebar, that’s almost the same way I got started. I loved cars and when I was about 8 years old, I would sit in school sketching when I should have been listening to the English teacher. J: During my years at GM, I interviewed and hired most of our designers. I would first look for the person who was known for doodling in his notebook when he should have been taking notes in class. If someone truly loves cars, that’s an important trait. Of course, good designers must have talent to go with their passion. That was the final judgment. V: What was your first car? J: I was born and raised on a citrus ranch. We had tractors and trucks and many acres of orange and lemon trees. When I was about 12 years old, I learned to drive the trucks on our property for spraying trees, pick up manure and other ‘romantic’ tasks. So I already had a good feel for driving when I got my license. My first highway car was a 1940 Ford convertible. V: Why did you choose a Ford? J: All through my younger days, I collected books on Henry Ford. We owned Fords on the ranch, and I always thought I would go to Ford Motor Company. At that time, I thought Henry Ford actually invented the car. He was sort of a hero, not knowing a lot of other things that he was up to. My dad gave me the ’40 Ford. It was wartime and the last year of high school for me. It was great fun. After graduating from high school in 1945, I went to MIT. V: What happened at MIT? J: Just like that. I didn’t realize the importance of that event at the time, but after seeing the studios, meeting the people at General Motors styling, and knowing the dominance of GM cars on the street, I decided General-Motors was where I wanted to go. V: How did you keep up your studies at MIT and find time to design and build a model? J: It wasn’t easy, but my passion for car design drove me. Over the Christmas holidays, instead of going home, I stayed with relatives in Massachusetts, designed the car and made scale drawings. Then I spent a lot of time in the hobby shop at MIT carving my design in wood and refining the shape until it was right. V: Do you have pictures and drawings left of that model? V: I’d love to see them. J: I donated my model to the Henry Ford Museum, and last time I looked, it was still there. V: Talking about surfaces in those early days, were you the kind of person that loved to clean and polish his car for the sheer feel of the shape? J: I can’t think of a better way to get to know a car’s surfaces than to wash it. Washing a good design is a pleasure. V: When you went to Detroit for the contest, was Harley Earl or Bill Mitchell involved? J: Yes, they were. I met Harley Earl there and a lot of the chief designers. They were the judges of this competition. They explained to us what they were doing and why they were doing it. They were quality people and I was really impressed. “Wow, this is the place to be,” I said to myself. V: What was your impression of Harley Earl? J: He was 6’4” with a dominating presence. Most people were in awe of Harley Earl, even feared him. He could be tough, but he could also be pleasant if you did what he wanted. V: Where did you start at GM? J: I started in the Orientation Studio for six months in order to get you up to speed. I was a junior designer. Most new designers wanted to work on cars, but I wanted to work on trucks. I saw an opportunity to do something with trucks because they hadn’t changed much since before the war and were due for a major redesign. I requested the truck studio. We worked a lot of overtime because the studio was small. One Saturday (we were all wearing jeans and t-shirts), the door opened and in walks Harley Earl, and he had an idea. That idea was later to become known as the EI Camino—taking a Chevrolet car and putting a pickup body on it. He sat down in front of the full scale line drawing to work on the design for a couple of hours. While I had met him during the model car competition, I, of course, didn’t know him at all and I had never worked with him before. He turned to me and said, “Now, young man, would you go up there to the board and raise that roof line one sixteenth of an inch?” So I did that, but I was shaking as I did it. That was a traumatic experience! V: How did you like the truck studio? J: I loved it. Our main project was the complete redesign of the 1955 Chevrolet and GMC truck line. These trucks were ripe for a radical change and we worked hard to accomplish this. We enclosed the running board, incorporated a wrap-around windshield, and developed a new pickup called the Cameo Carrier, with smooth sides that started a trend that’s still popular. I have the design patent for this truck line and my original sketches and renderings are still in my files. I’m proud of the design of these trucks. It gives me great pleasure to go to the Friday night Cruise-In in Escondido and see my design. The kids have taken off the emblems and stuff, painted them neat colors, and installed a V-8 and a new set of wheels. It’s amazing. After nearly 50 years, the basic shape of the truck still looks good. V: What happened after trucks? J: Harley Earl called me to his office one day and said, “I’m going to give you a little studio and make you the studio head.” That was my first appointment as Chief Designer (1954). Then he said, “Now I want you to design a crawler tractor for the Euclid division.” GM had just purchased Euclid. Harley Earl said, “They have an idea for a gigantic twin diesel tractor and I want you to go with Henry Lauve out to the proving ground. The prototype is out there. I want you to look at it and then do the design.” I did that and I thought, “Well, that’s kind of neat.” We did that without hemming or hawing. We just plowed ahead, didn’t ask anybody, just did what I thought was right in working with the Euclid people. After the completion of the crawler design, Mr. Earl asked me to design a train. He said to me, “We have an idea. We own a large locomotive manufacturing concern called Electromotive. Diesel electric locomotives were invented by GM and we are going to do a lightweight train. This train is going to be half the power and twice the fuel economy of a normal train. Railroads were having trouble in those days and Harley Earl said, “We are going to build the cars out of bus bodies.” So we just went ahead and designed the train. 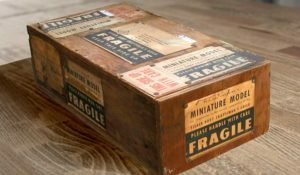 We finished the scale model, sent it down to Chicago and I spent many days in the engineering department where we laid out a full size locomotive on the floor using shipbuilding splines. Electromotive built the train. Finally the day arrived for the general manager’s wife to whack a bottle of champagne over the front end to christen the train. Harley Earl called me and said, “I want you to come with me. We’re going down to Chicago and see this train.” He was really pleased with this train. He wrote me a letter (he very seldom wrote letters). I still have it. “Chuck, I just want you to know how gratified I am with the way you handled the management of Electromotive and the train that you designed.” (Signed) Harley Earl. Later he sent word that I could put my ‘54 Corvette in the shop and paint it and trim it any way I wanted. V: Well, that was a real compliment and reward. J: It’s always encouraging to get a note from the boss and have a ‘show car’ Corvette to drive. But it didn’t stop there. I had other things to do. Bill Mitchell, assistant to Harley Earl, called me into his office one day, and I thought, “Oh boy, what have I done now?” He said, “Listen, kid, if you want to get anywhere around here, you’ve got to design cars.” I said, “Great, I’m ready.” So he gave me an advanced studio over in the main building. I was made Chief Designer with a studio of three designers, two engineers, and about five clay modelers—a great bunch of guys. Our first assignment was a Motorama show car called the Buick Centurion. V: Isn’t that car still around? J: Yes, it is in the GM Heritage Center and it was on display when I was honored by the “Eyes on Design” ophthalmologist group. I have also seen it at the Peterson Museum where it was the star at the top of the escalator. 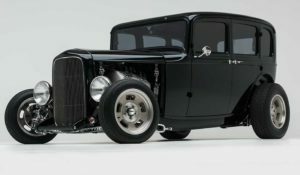 This was the car that I worked on through the entire process, from idea to finished fiberglass model, for the Motorama. Once we finished that project, we started working on advanced 1959 models. V: Let me stop you for a minute. When you were designing trucks and locomotives, did you feel excited about doing them or did you have in the back of your mind a preference for cars? J: I had a great experience designing trucks, tractors, and trains, but my true love was cars. V: Do you recall about what year you started designing cars? “Hey, we’d like for you to be chief designer for Cadillac.” Believe me, that was a red-letter day for me. You know, I have always admired Cadillacs. My dad had a 1948 Sedanet. And I used to drive that a lot. V: I had a ‘49 Sedanet with a standard transmission for about 11 years. I loved that car. J: That was a neat car. I always looked at Cadillac back in those days as the trendsetter. Of course, there was Chevrolet, Pontiac, Oldsmobile, Buick, etc. But there was only one Cadillac and it was THE car. It was a prestigious car, and there was nothing that could compete with it. People were excited about it. It was a style leader. V: The ’48 and ’49s really impressed me because you could run your hands over the fenders and over the hood and across the top in the back and you feel what the designer must have felt were smooth, merging, well proportioned lines. J: One thing about GM, they were really good with surfaces, and that was the reflection of Harley Earl’s passion and the time he spent with the modelers to get the surface right. V: Tell me a little bit more about your first project at Cadillac. J: When I went to the Cadillac studio, the ‘59 was partially finished, so first out of the box I had the responsibility of completing the ‘59 model. We had to do the limousine and refine Some of the clays. V: Who was instrumental for those extreme fins? Was that a Harley Earl touch? J: No, it wasn’t. Harley Earl was responsible for the fins as they developed through the years, but not the ’59. He was still there during the ’59 development stage, but there was a little revolution in GM styling at that time. As designers, we didn’t like the ’57 or ’58 models where Harley Earl insisted on those real heavy bumpers, thick roofs and lots chrome. He thought the more chrome it had, the more expensive it looked. Some of us didn’t agree with that, but Harley Earl was a tough guy. He could fire someone if he didn’t like them or if the guy didn’t do what he said. He was a real dictator. I never really saw that side of him fortunately, but I guess I never did anything that got him upset. Even Bill Mitchell had a little fear of Harley Earl. Harley Earl went to Europe in the summer of ’56. Sometimes I liked to get away during lunch time to collect my thoughts, so one day I drove to the Plymouth factory about seven miles away. I thought to myself that these guys must be making their next year’s model by now. I think I’ll go down and look to see what I can see. What a shock! There were all these ’57 Plymouths backed up against the fence, and all I could see were fins. But it was more than the fins. These cars were really sleek, they were lean, and they looked like they were moving standing still. The roof was very thin and they had that simplicity and dash that our cars didn’t have. Our cars looked cumbersome and heavy, and didn’t have that contemporary design quality. I went back to Bill Mitchell and said, “Bill, you better come down and look at what the Plymouth guys are doing for ’57.” So a couple of chief designers, Bill Mitchell and I went down there and looked at those Plymouths that afternoon. Keep in mind that we were already working on our ’59 models that looked like an evolution of the ’57 and ’58 models. That same afternoon, Bill started a second ’59 design in each production studio. Of course, Bill didn’t stop Earl’s designs, but he started a competing design that reflected a more advanced look. We really worked fast and hard to get the new design developed in clay. By the time Harley Earl got back and walked into the studio, he was speechless, and he turned around and walked back out. It was a couple of days before he realized he’d better join the party and saw the advantages of what we were doing. And you know what happened? The ’59 cars were spectacular! On the Cadillac, we probably overcooked the design of the fin. Still, it was tame compared to what it could have been. I can remember when the fin on the clay model was higher than the coupe roof. J: You know the coupe roof was always lower than the sedan. We were just trying to see where the limits were. We finally gained sobriety and trimmed the fins down to production height. V: Dave Holls mentioned to me a couple of times that he was excited during development as a design exercise but he was almost embarrassed with those big fins for a couple of years after production. In fact, in retrospect, he much preferred the ’60 model. J: Holls was the guy that did the original ’59 fin sketch. I wish that the original sketches were still around, but pictures still exist. Realizing that we had overcooked the ’59 model, we started the ’60. We had a young group in the Cadillac studio. None of us were much over 30 and we had guys like Bolls who had an outstanding knowledge and feel for Cadillac. We all agreed that the ’59 looked too exaggerated, so we lowered and simplified the fin, refined the bumpers, redesigned the rear quarter, and cleaned up the overall design with elegance and substance more appropriate to the Cadillac line. V: It just looked more refined. V: By the way, where did the idea of the flat top come from…with that huge wrap-around rear window on the 4-door hardtop? J: From a sketch. The whole idea was to differentiate the 4-door hardtop from the regular sedan. We had the 2-door hardtop and we wanted a 4-door hardtop that had more flare than the normal sedan. That flat top design seemed to be the answer. V: While fewer flat tops were sold than the other designs, today it is one that stands out as unique and interesting. It draws a lot of attention. J: Well, you know, in design, who can say why…we just thought it was the right thing to do at the time from all the ideas we had under development. We thought that one had some dash, and still had character appropriate to Cadillac. V: What about the skeg on the 1961 models? J: For years, Cadillac demanded a door protection molding on all ‘62 series cars. It was usually a simple chrome molding extending the length of the body at its widest point. As designers, we hated these add-on moldings. Since the ’61 was an all-new body, we were determined to integrate it into the design. We sketched in search of a theme. Our plan was to reduce the importance and height of the fin without losing the Cadillac feel. The skeg (ala the Cadillac Cyclone Show Car) was a lower fin with a chrome leading edge that acted as the door guard. The skeg turned out to be an important element in the new design. It lasted 2 years: ’61 and ’62. For 1963, which was a major body redesign, we returned to a simple clean body shape (like the ’60) with more substance and elegance. The ’64, the last model in the ’61 to ’64 series, was a facelift of the ’63. My personal favorite was the ’63 because it seemed to capture the essence of Cadillac better than the others. V: These are some of my very favorite models. I drove the ’64 for about five years on a daily basis and loved every mile of it. J: The ’64 was the last year of the fin and a great car. V: Why were the fender skirts eliminated on the Eldorado in ’64? J: It was to differentiate between the Cadillac ’62 series convertible and the Eldorado. Remember, in ’59 and ’60, the only difference had to do with the amount of chrome and how it was applied on the side. In ’64, the intent was to make the Eldorado look sportier by exposing the rear wheel. V: Were you involved with the ’65’s”? J: I finished the ’64 in the studio and released it for production. Then, as fate would have it, Mitchell’s assistant, Ed Glowacke, a fine gentlemen and a great designer, died of leukemia. All of a sudden there was a vacancy and Mitchell said to me, “You are going to be the Executive in Charge of all the exterior design studios.” So, I left Cadillac studio to watch over the exterior design of all GM cars and trucks as Mitchell’s assistant. That was a great opportunity for me. V: You mean across the board, all divisions? J: Yes, GM Design is a staff responsible for the design of all GM vehicles, plus advanced design. V: Was there good coordination between the interior and exterior studios? J: Not really. In the early days, interior design never got the attention exterior design did. After all, interior design was rather simple—an instrument panel, some door trim and selection of colors and fabrics. The interior design was actually done in a separate room from the exterior, but as interior design became more complex and more important, we decided to put the exterior and interior together in one studio. The result was better coordination, a more unified design and happier people. V: I’d be interested to learn how the approval of a design was obtained. Who was involved and what did it take to get a design approved? J: I’ll talk specifically about Cadillac’s case, but the process was very similar for other divisions within GM. Throughout a program, we worked closely with Cadillac Engineering. They were always checking our progress and we would discuss any problems as they saw them or any compromises that we needed to have them make. On the manufacturing side, Wally Satarski was the greatest manufacturing guy I ever knew. He could do anything and his positive attitude and his ability saved many of our designs. Between engineering, manufacturing and the studio, we pretty much put the car together. At least once a month we’d have a meeting in the studio with the general manager and his staff (sales, marketing, financial). Not a lot of people but decisions were made. Occasionally, the president would drop by to see what we were up to. Once a year there was a big event when the Board of Directors met at the proving grounds. We would show the Board next year’s cars for their approval. It was almost a rubber stamp affair. In reality, the General Manager of Cadillac was the main man in approving Cadillac’s design. V: Did he usually concur in your design proposals? J: Yes, I don’t remember any cases where we had any serious conflict. There were changes that we had to make for functional reasons, or for cost reasons, but we got along fine. Jim Roche and John Grettenberger were my favorites. Both were fine gentlemen. They respected us and we worked our hearts out for these two. Together we worked smoothly and got the job done. V: As a designer, what is your philosophy and approach? The problem with a lot of cars today is when people see them, there’s little emotional “Wow.” If a customer is not strongly attracted to your design, all the other physical attributes of the car have little meaning. V: Isn’t there a certain amount of intuitive sense whether or not the design is good and will excite the customer? J: Yes, in fact a designer intuition is absolutely critical to a successful design. Harley Earl and Bill Mitchell both had a remarkable intuition. That’s what’s great about Lutz today. He’s no designer but he has a keen sense of what’s right and what looks good. V: While you were at Cadillac, what stands out in your mind as significant and that you felt good about? J: The 1967 Eldorado was a new and imaginative approach that I was really proud of. All of us young guys in the Cadillac studio were after a sporty, elegant Cadillac. It took four years in the advanced studios trying different approaches. Some were 4-doors, some 2-doors; some front drive, some rear, but Cadillac couldn’t afford a standalone car. So when the Toronado and Riviera were proposed on an all new FWD platform, we saw our opportunity. We knew what we wanted to do and we did it. The proportion and shape of that car still looks good today. V: The Toronado came out one year ahead of the Eldorado. Was that some kind of a test to see if that would go over with the public? J: No. The Toronado, Riviera, and Eldorado were developed simultaneously. For some reason, which I’ve forgotten, the Eldorado program was delayed one year. V: Was there any validity to the rumor that the long nose was in consideration of possibly accommodating a V-12 instead of a V-8? J: No. A V-8 was the only engine considered. The long hood was the result of our desire for a sporty elegant proportion. We did do some advanced design work on a V-16 Cadillac. Dave Holls kept preaching to us about the old days when Cadillac had a V-16. During the ’60s we did several V-16 scale models. Talk about proportion! But they were more inspiration than serious proposals. I do know Cadillac, at one point (I think in the ’70s), did design and built several V-12 test engines but nothing came of that. J: Yes. The V-16 made a clear statement with a capital “S.” I still see V-16s at Pebble Beach. They were, and still are, handsome cars. V: After you left Cadillac, where did you go? J: I was promoted to Executive in Charge of Automobile Design Studios in 1962. Mitchell thought I would benefit from “running-my-own-show,” so in 1967 he sent me to Germany for three years as Director of Design for Opel. When I returned to GM Design, I was again Executive in Charge. When Mitchell retired in 1977, I was named Director of Design. V: What are your impressions about Bill Mitchell? V: I understand that Chuck Jordan had a similar touch much like Mitchell. J: I learned a lot working with Bill Mitchell. This is an emotional business. The leader needs to have a clear philosophy and set design direction. Yes, I was tough and an aggressive fighter for creative design. The mediocre designers weren’t crazy about this but the talened ones loved it. When you’re dealing with emotional creative people, you have to keep them stirred up and excited in a free environment. If they make mistakes, fine. You throw them in the waste can. We filled a lot of waste cans, but we also hit on some great ideas. V: You were appointed Vice President of Design in 1986. What were the highlights of your experience in that capacity? J: When I took over, design staff was down. Their creative, juices weren’t flowing. So my first job was to get these guys ‘up’ and excited again. My goals were to design distinctive cars and bring back beauty, elegance and excitement in our designs. I put a premium on creativity and we started to have fun again. One of our first and most successful designs was the Cadillac “Voyage”—an advanced image car to show Cadillac and corporate management where we were headed design wise. It helped. But my favorite design was the ’92 Seville. We started the ’92 Cadillac program focused on the Eldorado. The Seville didn’t get much attention and we were falling behind schedule. Designer of Cadillac), “Hey, guys, we’ve got to get going on the Seville!” The Sunday I returned, I took a quiet walk through the studios. 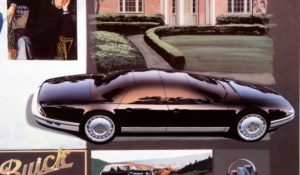 When I opened the door to the Cadillac studio, I was “floored.” There in front of me was a mockup of a new Seville design using c1aycolored cardboard and black tape. The design was great and I said to myself, “That’s it! We completed the full size clay model and released the final design on time. In 1992, just as the Seville came out, I retired. V: I can see that you have not lost any passion. It is almost as if you have more passion today than ever. Is that an accurate observation? J: Right now, I’m teaching high school as a volunteer. I’m there one hour daily teaching car design. The course is offered as an elective course and is made possible because the principal is a “car nut.” He sees the value in offering the kids something creative in addition to math, English and history. So that has been good fun for four years. I love kids. I get as much out of the class as they do. It forces me to prepare my lessons the night before, get up the next day, get dressed and then drive 80 miles round trip. I spend an hour with kids who are in class because they want to be, not because they have to be. V: Is there a lot of talent out there? J: Four years ago the leading student was a girl; a very smart kid and a talented designer. She is now at the University of California at Berkeley studying engineering and design. Three years ago the top graduate was an African-American kid, who is clean cut, well spoken, and just a wonderful guy. He’s got more talent than anybody I’ve seen for years. Now he’s studying at the Art Center and there are two more students who are now preparing for Art Center. When you’re teaching design, you can’t talk about it. You’ve got to show the kids what you mean. So I’m back to designing cars and I’m having fun. V: Given the chance to summarize your career, what would you say? J: I consider myself one of the luckiest guys alive. All my life I’ve been able to do the thing I love most—design automobiles. It’s always been exciting and fun, and and never quite seemed like work. The biggest reward for me was seeing my idea coming down the street. But, remember, no one man designs a car. It’s a team effort with fellow designers, sculptors and the technical people. For any success I’ve had over the years, I owe much to the talented creative people with whom I worked at GM Design through the years. Thanks to you both for making this excellent 2006 interview with Chuck available. 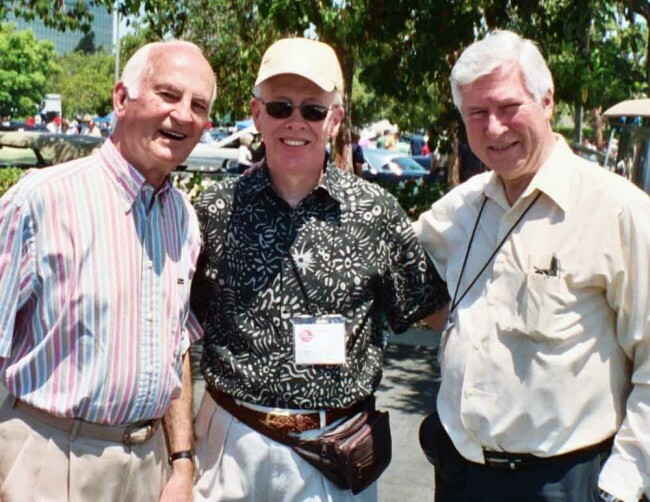 Timing of this is especially significant with the advent of Chuck being inducted into the Automotive Hall of Fame on July 26th, 2012, on the eve of the St. John’s Concours d’Elegance of America. ‘Wish Chuck were still with us to receive this most deserved ‘honor’ in person! However, his legacy, passion and spirit live on….. Interesting interview, and thanks for posting it Gary. I particularly liked the story about sneaking down to the Plymouth factory at lunch to check out the new Plymouths with “fins”. I remember those cars as being really slick also. I had a few run ins with Chuck, but generally respected and admired him. He was certainly an impressive figurehead for Design. Chuck Jordan was a good friend. I first met him when I was 14 at that 1947 Fisher Body Craftsman’s Guild banquet when he won his scholarship, as I had been invited back after winning in 1946. I was put in the same room as Chuck at the Book Cadillac Hotel in Detroit and I drew sketches for him. He was very appreciative of me and we hung together in that trip through Styling. I had known Harley Earl from the time I was 4 years old when my father was the Chief Designer of Pontiac. Harly was great to me then, too. Every time I met Chuck after 1956, he would tell me the story of seeing the ’57 finned Plymouths and running back to tell Bill Mitchell about them. I’m sorry that I’ll be unable to attend Chuck’s induction to the Automotive Hall of Fame. Chuck Jordan was a truly great designer and automobile enthusiast. I’ve always believed that any success I may have achieved during my career at GM,I owed to Chuck.He hired me out of Art Center and believed in me when I worked for him.He had so much passion for all things “design” that you just couldn’t help but want to please him.This week as he is admitted into the Automotive Hall of Fame,it’s a fitting tribute to one of the true legends in the Automotive Design profession.We miss you Chuck!